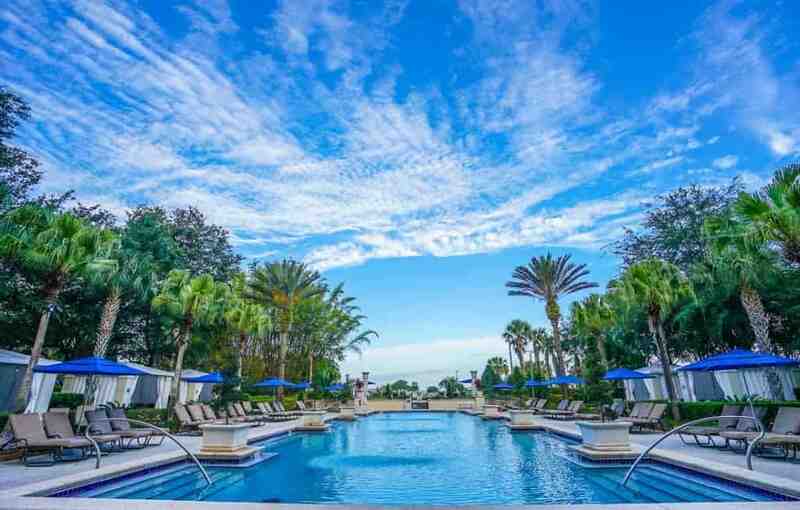 The Omni Orlando Resort at ChampionsGate really surprised me. I would say not only surprised me, it impressed me. 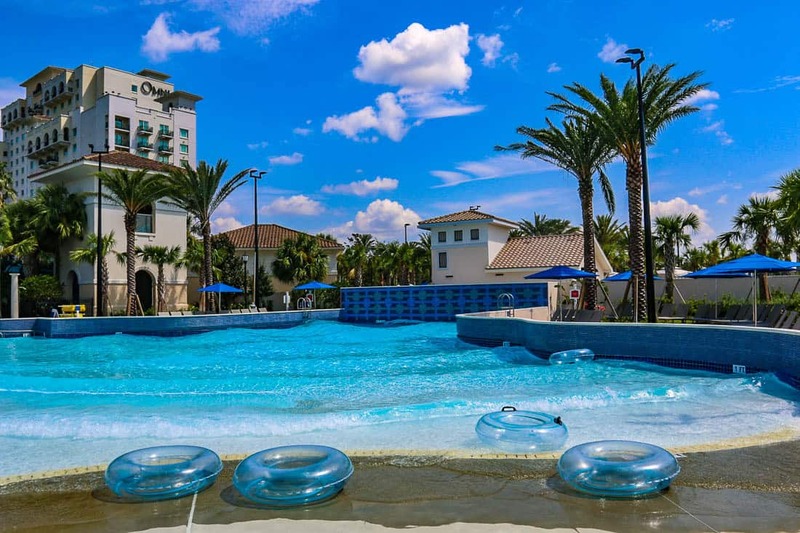 The Omni Orlando’s new wave pool opened in the summer of 2017. I had few expectations checking into the Omni Orlando. 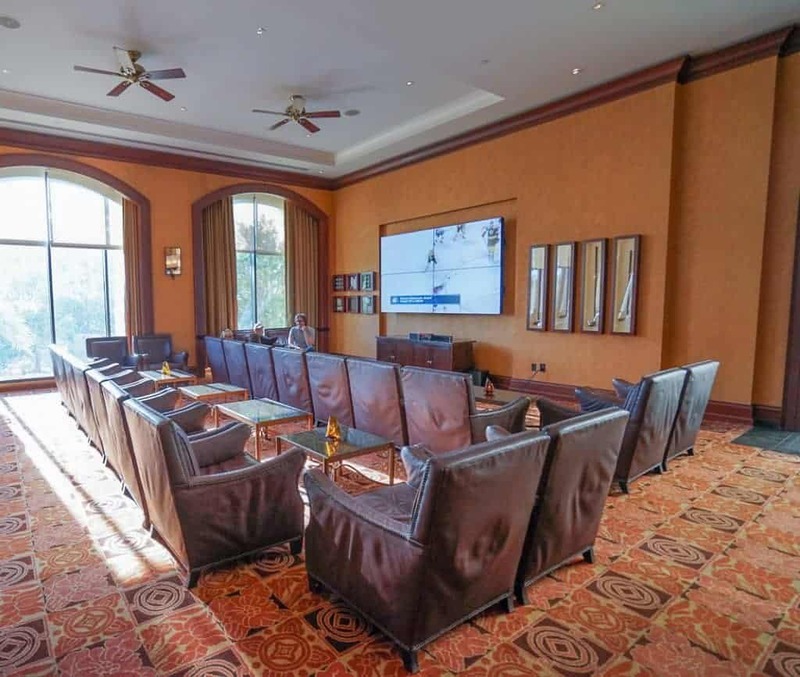 I don’t typically stay at many Omni properties, and I associate them with their historic mountain resorts like the Omni Mount Washington in New Hampshire or the Grove Park Inn in North Carolina. So it was a pleasure seeing what the modern side to an Omni resort experience is like. 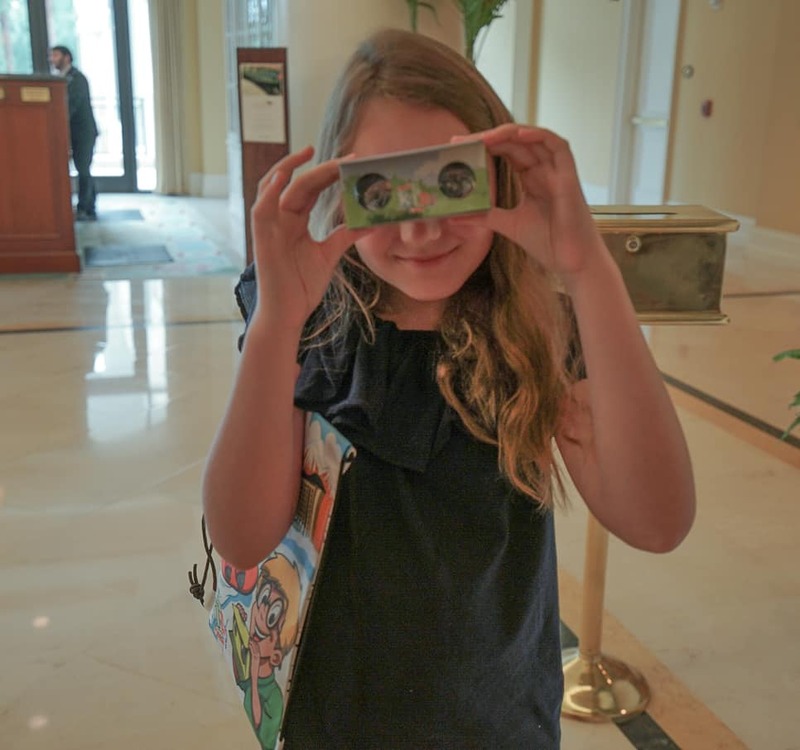 Just like the historic mountain resorts, my kids were greeted with Omni backpacks filled with activities. Omni Kids get backpacks at check in with simple activities and a passport to stamp for a prize. 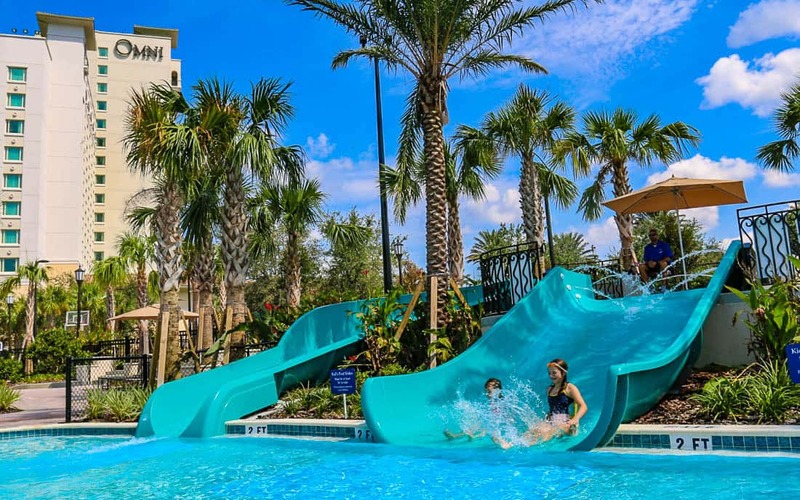 This Orlando Omni hotel encompasses 15,000, acres and I can’t think of another resort in the area that offers more recreation on site for families to do. You simply won’t be able to do it all in a few days. 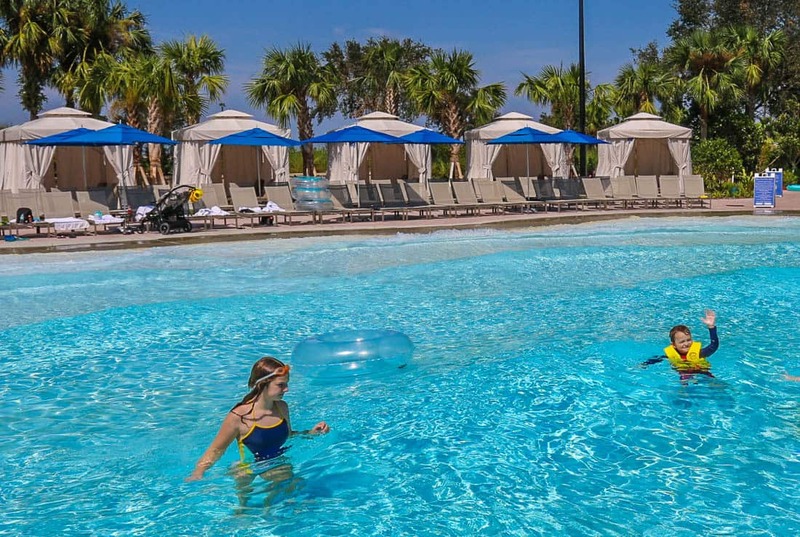 This resort offers more on site than most in Orlando, including the first resort wave pool that opened Memorial Day weekend, 2017. 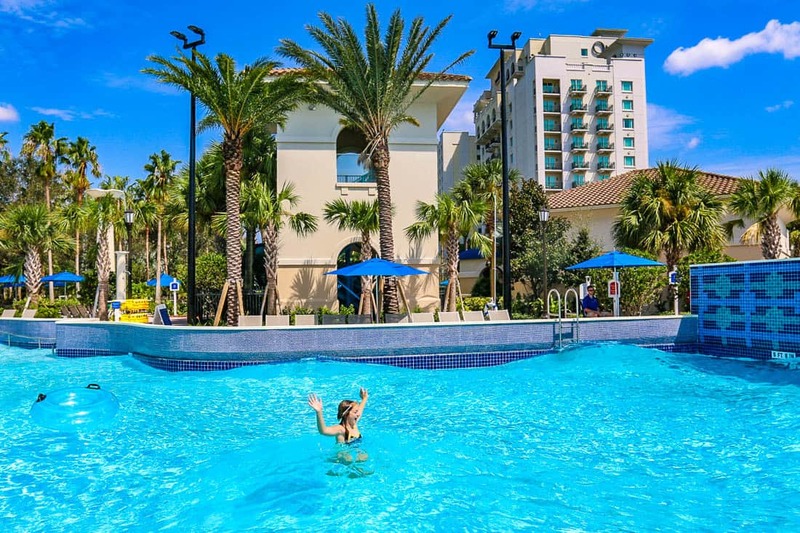 The Omni is located about 25 minutes southwest of Disney World, and more off the beaten path for Orlando theme park traffic. This massive resort gets most of it business from meetings and conventions. The reality is Walt Disney World is 40 square miles, and there are many locations within the resort that take 20 minutes to travel to, so for a place 25 minutes away you have to keep that in perspective. Those extra miles away bring significant value and savings compared to staying on property. 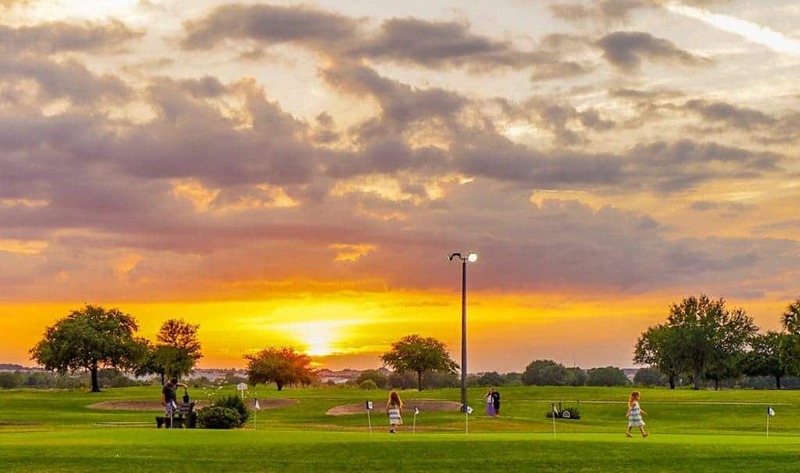 The Omni is located within the ChampionsGate planned community with three golf courses. 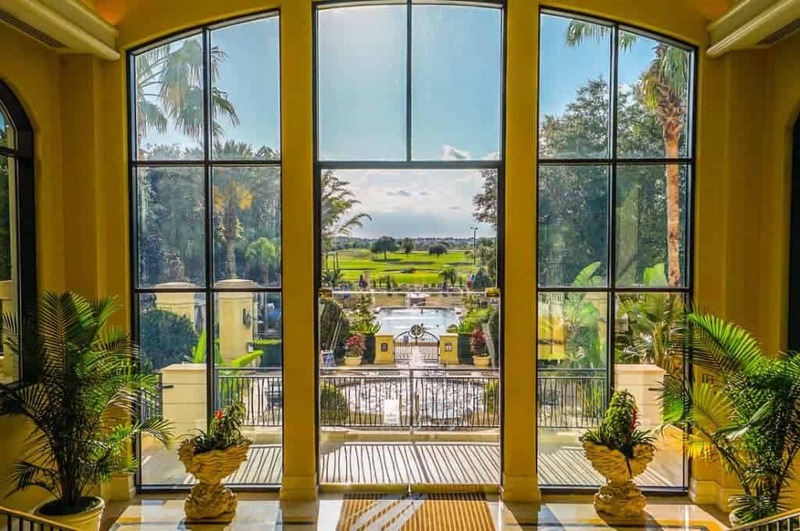 ChampionsGate Orlando homes are some of the most luxurious and sought after to rent for those who prefer that vacation style (Me, I like room service). The rooms at the Omni are solid for a 4 to 4 1/2 star hotel. 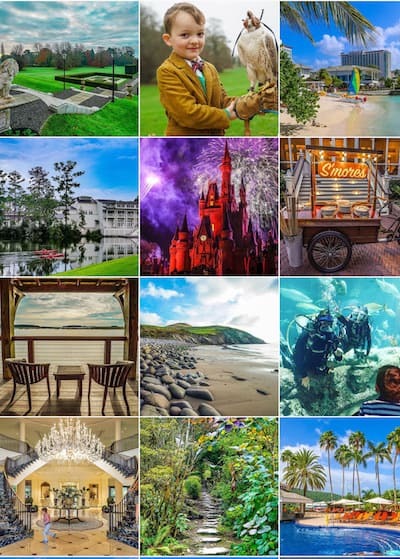 They still out perform most on site Disney resort hotel rooms in their comfort and quality. 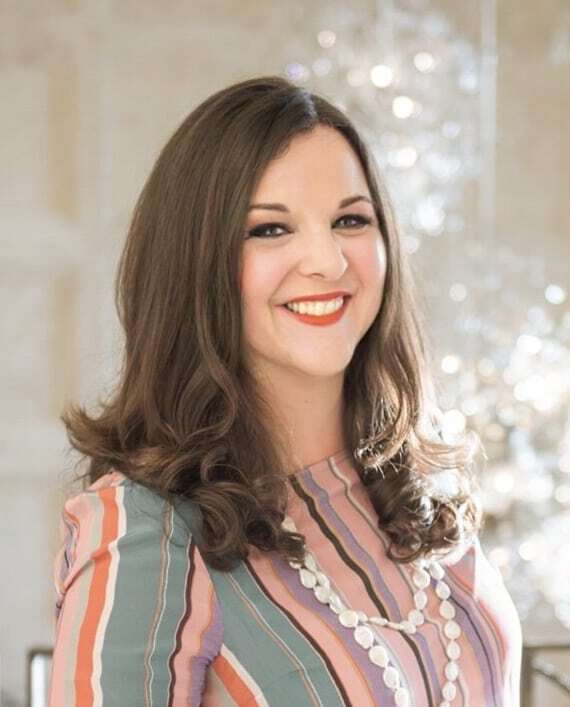 I would put the rooms’ comfort and design in between the renovated rooms at the Swan and the rooms at the Waldorf Astoria. Families can choose between adjoining rooms or multi-bedroom villas on property. 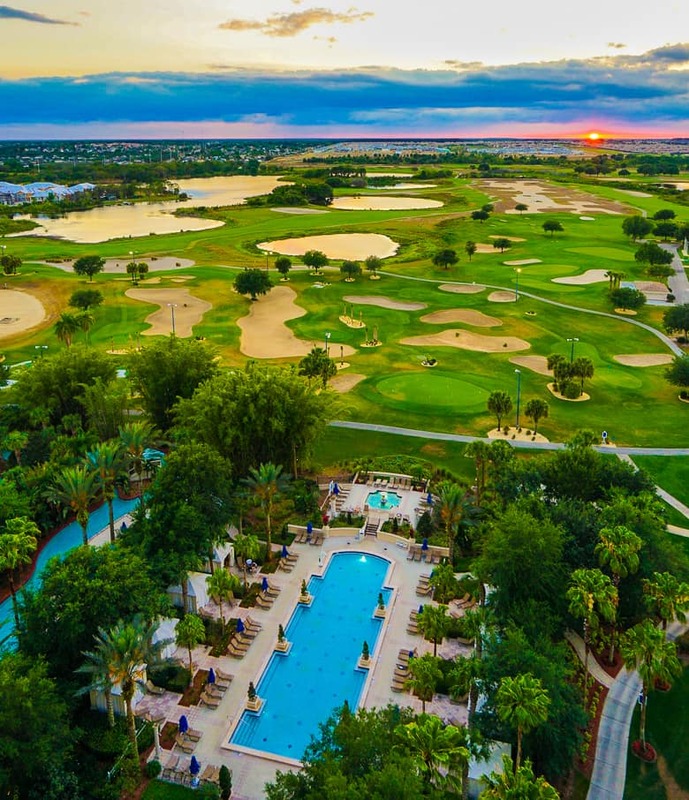 Balcony views are an incredibly impressive asset of a stay at the Omni ChampionsGate. The views go on and on. Check your travel dates for rates at the Omni. I loved drinking my morning coffee on Sunday to watch so many hot air balloons from my balcony at the Omni. If you have the benefit of a pool view, there are two additional jewels to these vistas. If the weather is favorable you can drink your while looking at a sky filled with hot air balloons. And at the end of the day, the sunset views are Texas sized and beautiful. The resort is massive, with views that go on in every direction. Pay for the pool and sunset facing balconies. Speaking of morning coffee, I loved that the hotel gives guests a breakfast beverage card to complete the night before, similar to a traditional room service card, but each guests receives one free morning beverage. A la carte items like a banana appear for a reasonable price, too. As a family we hardly get out of the hotel room without spending $50-$75 on room service in the morning so this was a delightful amenity. 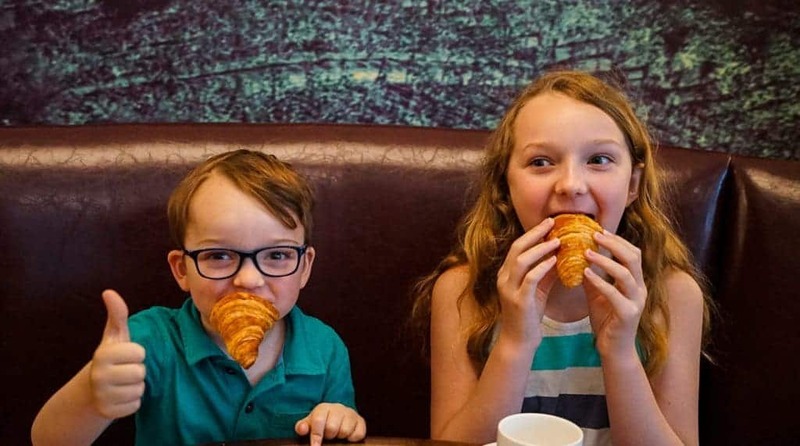 I was very impressed to know that on each hotel floor near the ice machines, there was also a microwave to complement the mini fridge in the room to make kids meals or snacks easier to prepare on the fly. We have also had an Executive King Suite which offers a queen size pull out sofa. The extensive bathroom was wonderful for a family to share. There are also villas on site that offer two and three bedrooms with kitchens. A new room expansion will debut by 2018, and I will update with photos. This Orlando resort delivers in the pool department. 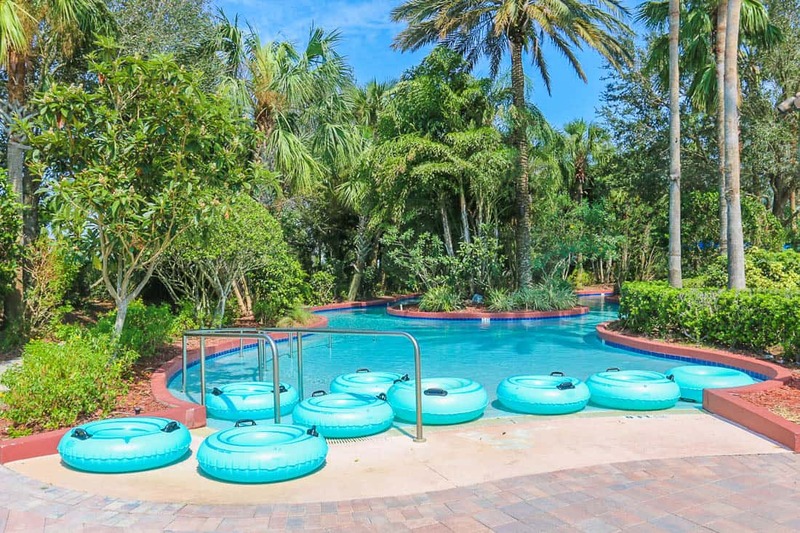 In fact, I will say it is now our favorite pool in all of Orlando. 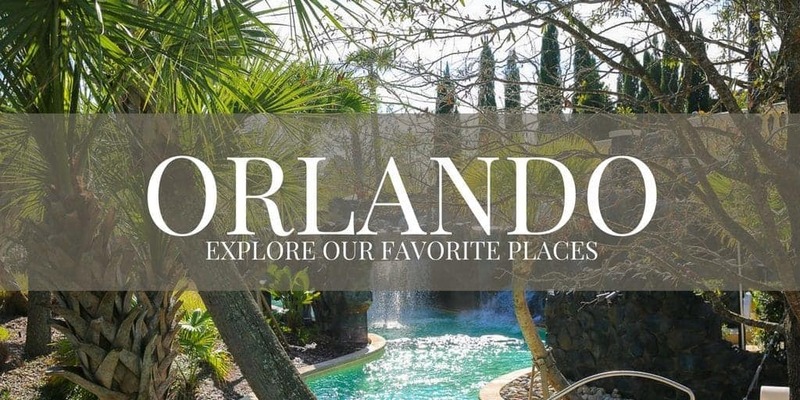 Yes, it beats every five-star property in Orlando if you are a family looking for a day of water fun. 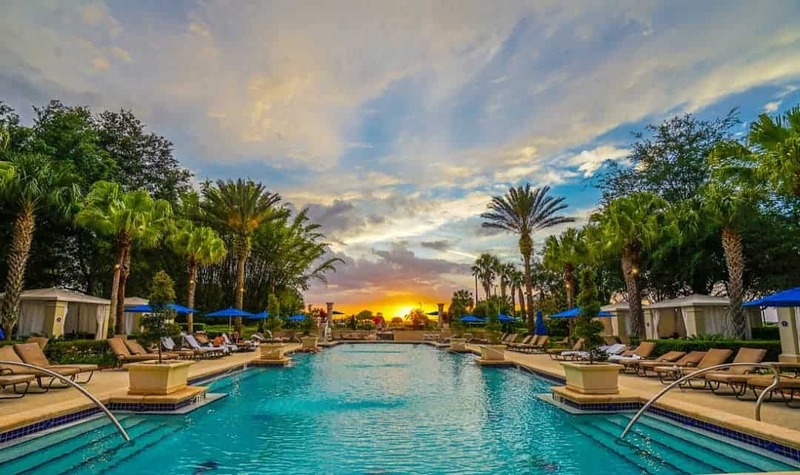 The Omni Orlando Resort formal pool. The formal pool, flanked by cabanas, has a front row seat of golf course views and nightly sunsets. 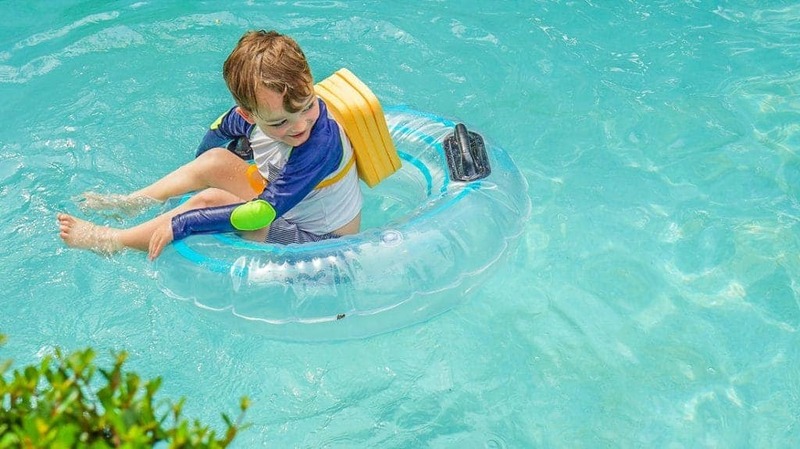 Although it is slated as the formal pool, there are no signs prohibiting children. The serene environment manages to control their voices, and it remains a restful peaceful place for everyone, including a few mermaids we saw. Even a mermaid needs a restful dip. Cabanas at the Omni are my favorite now for the value and experience. 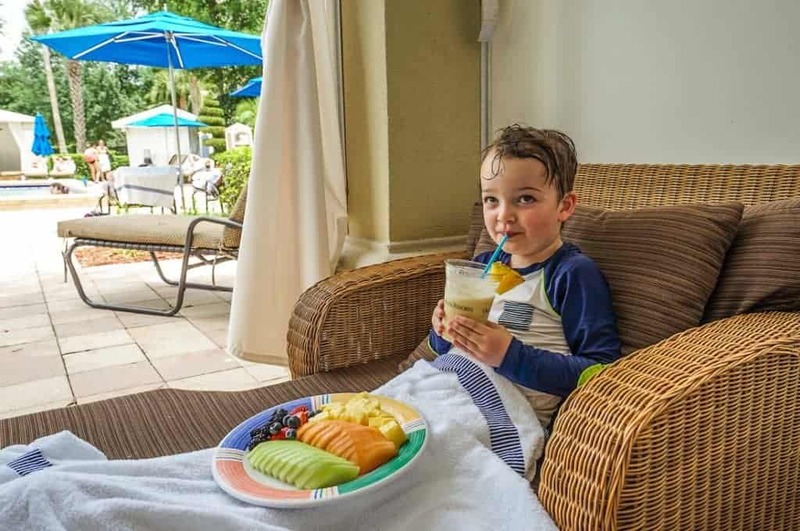 For about $250 a cabana package includes an appetizer plate with fruit, pitas, and hummus, delicious cookies, some frozen drinks, and ten beverages: water, sparkling water, or soft drink. Loved every bit of our Omni pool cabana rental. The lazy river is long, shaded, and winding. 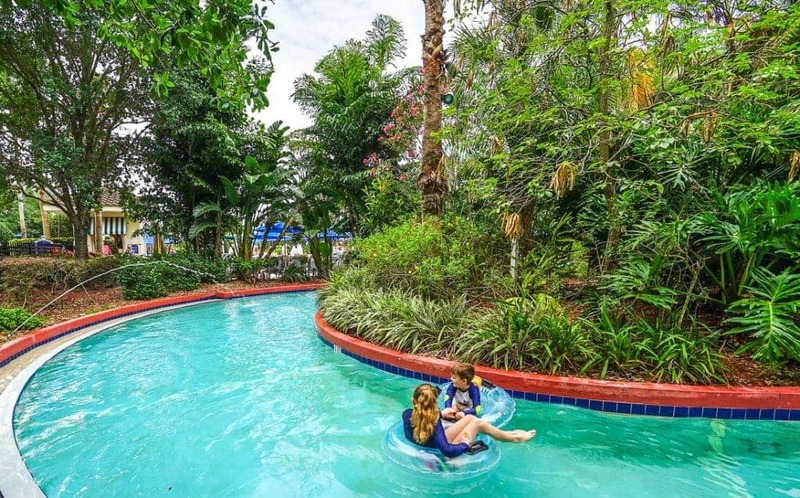 This is our new favorite lazy river in Orlando. 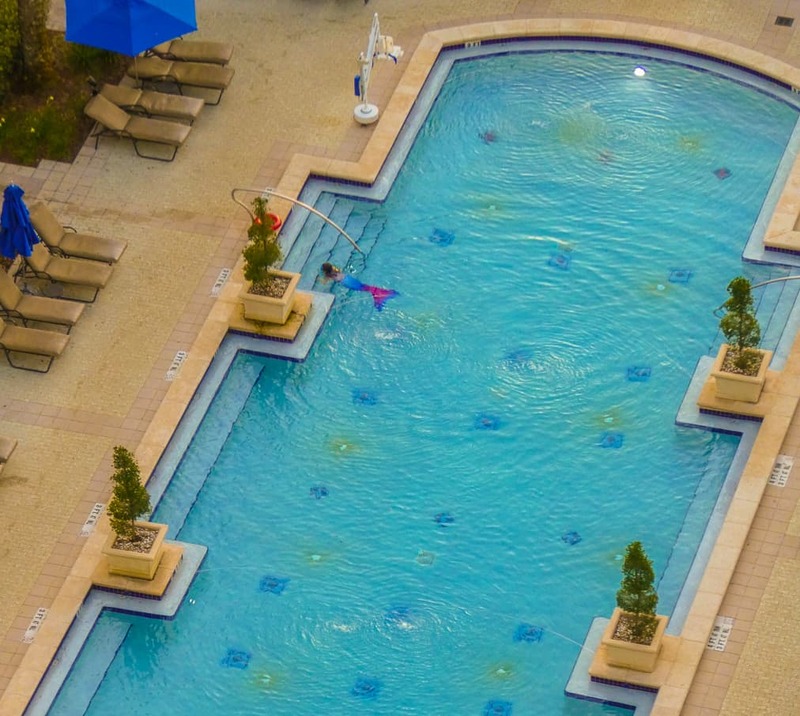 Between the formal and family pools lies our new favorite lazy river in Orlando. It winds through shaded, lush landscaping, has a jetted bubble area, a cannon that fires water periodically, and other water sprays. We spent hours in this. I think a good lazy river is as effective as family yoga. It most closely resemble the lazy river at the Four Seasons, a true favorite of ours, and it comes at 25 to 30% of the their nightly rate. The main family pool offers a two0story water slide and a zero-entry area. We thought we were a lazy river family, but on this trip, we discovered we were a wave pool family, too. This new pool opened in May of 2017, and our midweek in September pool day meant the resort was very, very quiet. We had the wave pool to ourselves for about an hour before more families showed up. It was incredible. A well timed, mid week morning gave us the pool area without crowds. The family cabanas surround the new wave pool and life vests are provided for children not strong enough to swim in the waves. Family cabanas flank the new wave pool and the new splash pool. 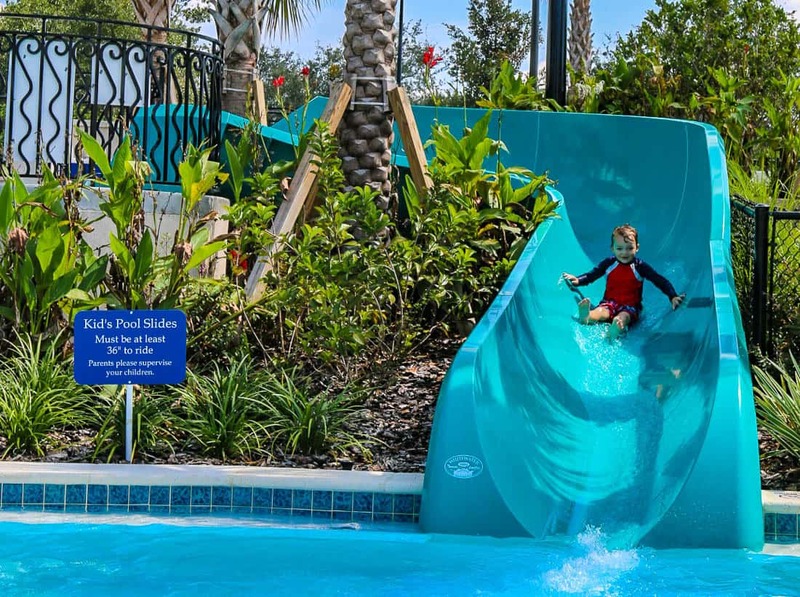 A new children’s pool has two shorter waterslides perfect for children too young to climb the taller water slide. And even better, there’s a double width slide in between the two that my children loved going down together. All of the pool floor beneath the slides had thick cushy padding, to make landing in such shallow water comfortable. We now call this the sibling slide. The pool floor is very well padded for little ones to land gently. This was the only place where the Omni didn’t score a slam dunk for me. The breakfast buffet in Trevi was impressive and extensive, offering grits with rock shrimp and other toppings, as well as a local honey bar. 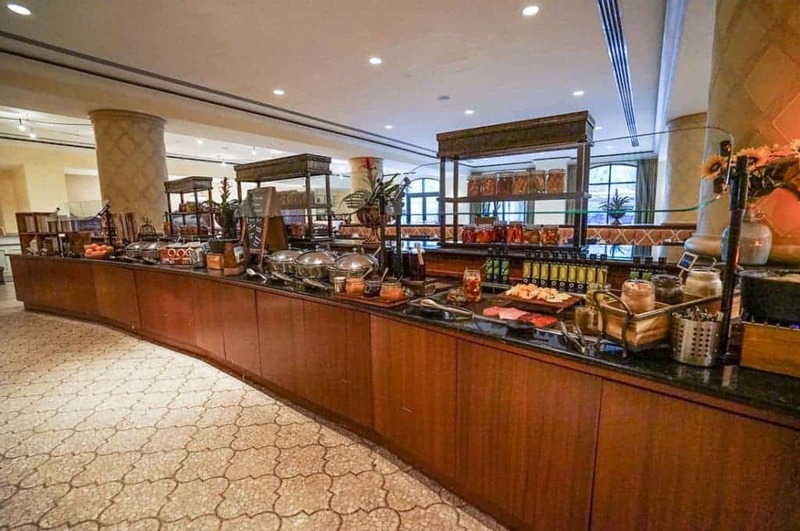 Liked the grit bar at Trevi’s breakfast buffet each morning. The cooks at the omelette station handled all of our custom egg orders flawlessly. My kids loved a pizza making experience in Trevi offered for kids with advanced reservations in the afternoons. We’ve now been making pizza at home ever since. Stick to the Italian restaurant in the basement or the pool for casual fare, and you won’t be disappointed. My kids discovered the ultimate fried comfort food, the mac’n cheese balls are a must to eat in a wet swimsuit. 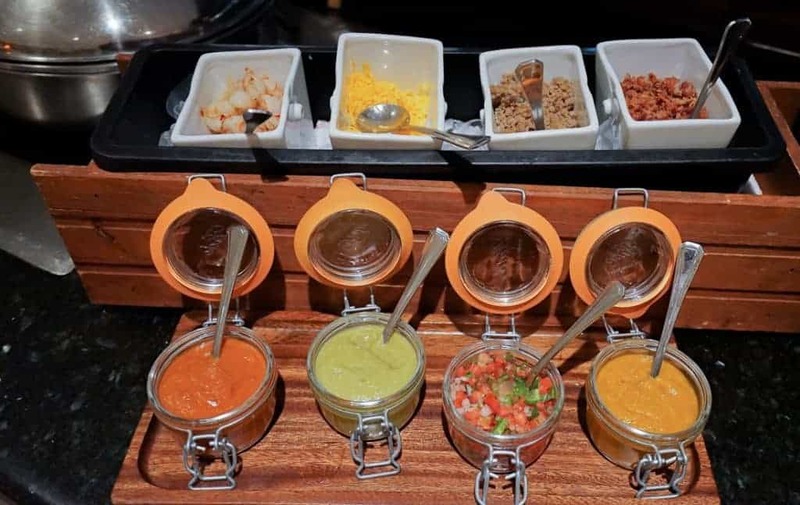 The resort, in my opinion, is missing a restaurant with a menu showcasing current cooking trends and interior design. Although service was good at Zen, the quality of my dishes didn’t really match the premium resort prices I paid. I did order a few pieces of sushi, and that proved to be the better choice over the Chinese inspired dishes on the menu, which didn’t really outperform our local take out in Boston. 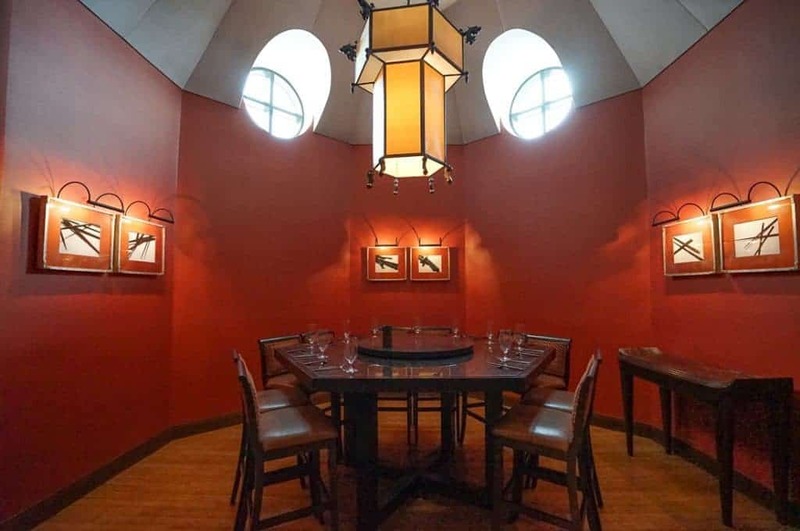 A private dining room at Zen. The sports bar on site we skipped, but it did look like a fun place for people to watch a game with its theatre style chairs. The game viewing area of Dave’s Sports Bar. The Mokara Spa next to the fitness center was the real deal, a small haven within the resort. 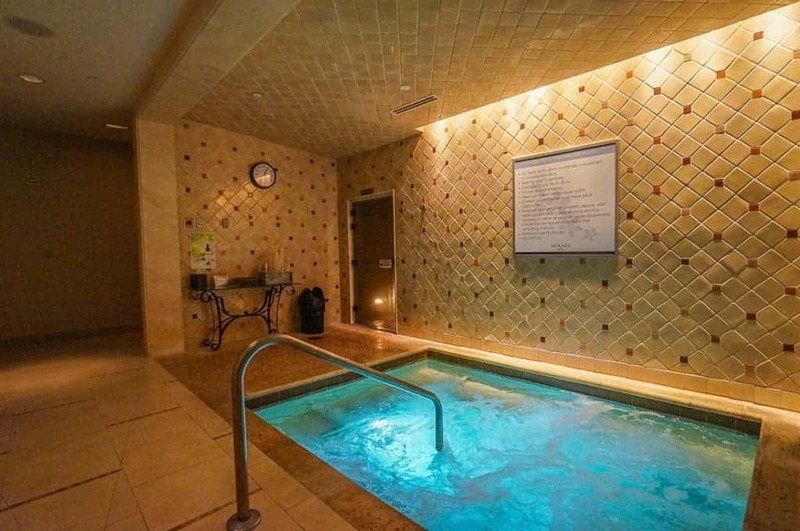 The lounge and wet areas are not built for large crowds, but the massage therapist I had was top notch and had been at the spa for nearly ten years. I would return in a heartbeat to try more services. 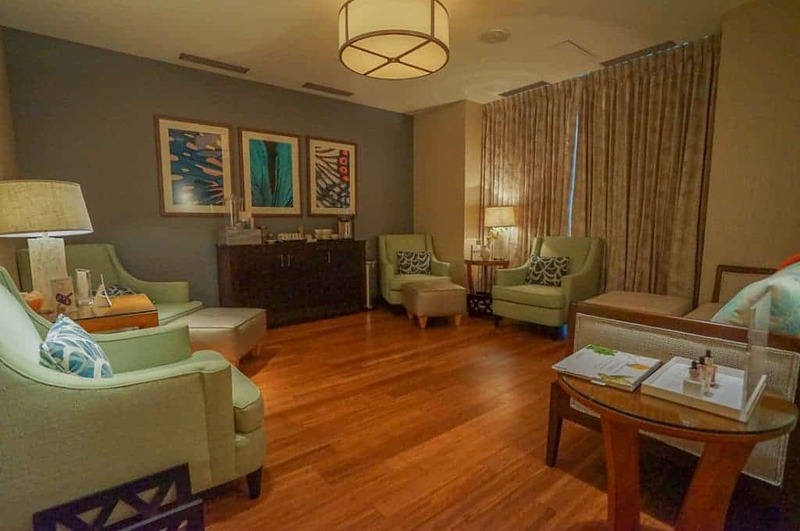 In the summer, the spa offers a special teen program every afternoon with age appropriate treatments and a gelato. 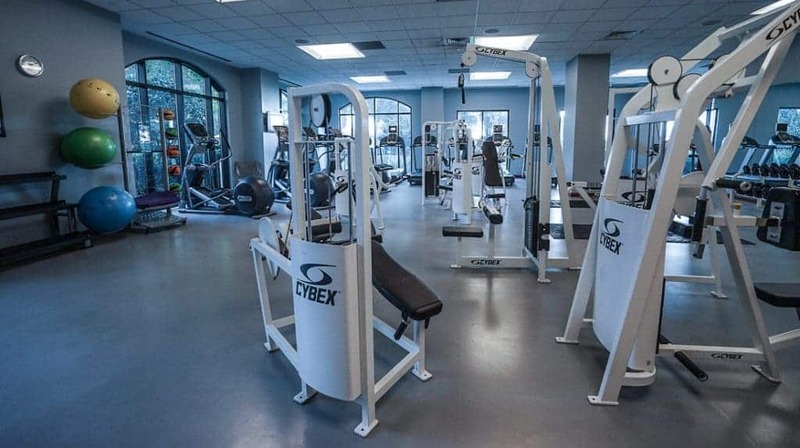 The gym, by contrast, was massive, and filled with various types of equipment. 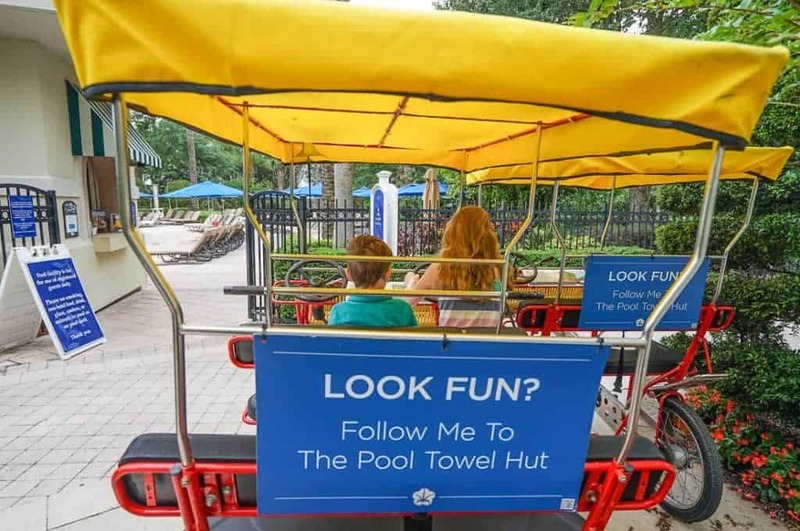 There are many things to do for kids besides play at the new wave pool. 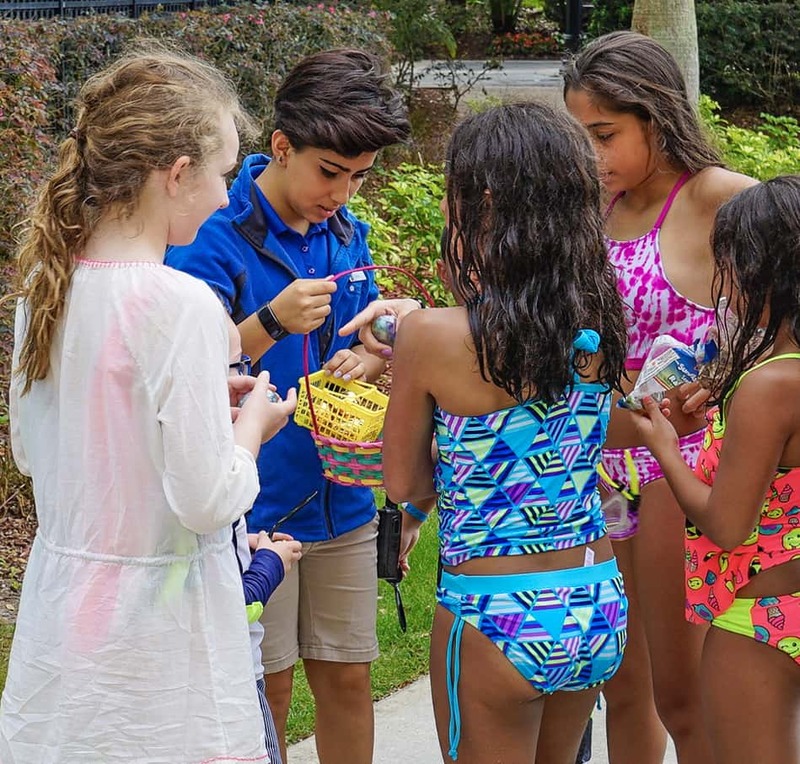 Lots of resorts have scavenger hunts, but with the resort this size prepare for the scavenger hunt to take a few days to complete. 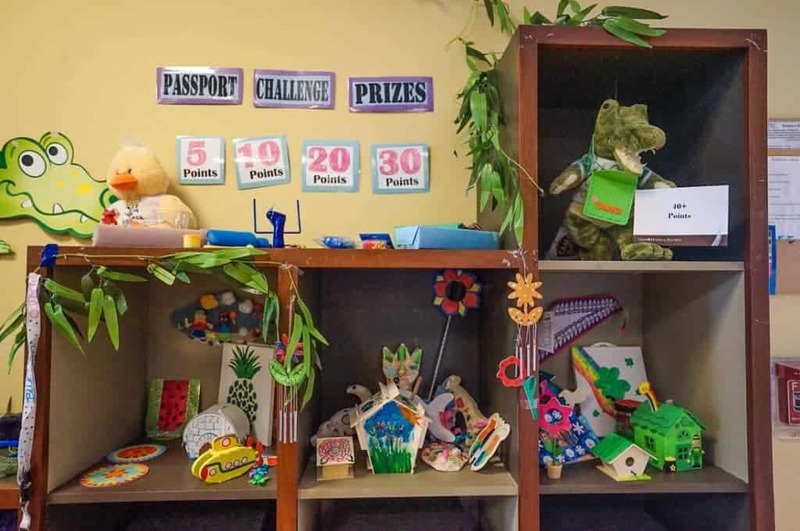 Children return to the kids’ club with their stamped passport to choose a prize from the toy bin. Kids receive this passports in their welcome backpacks at check in. 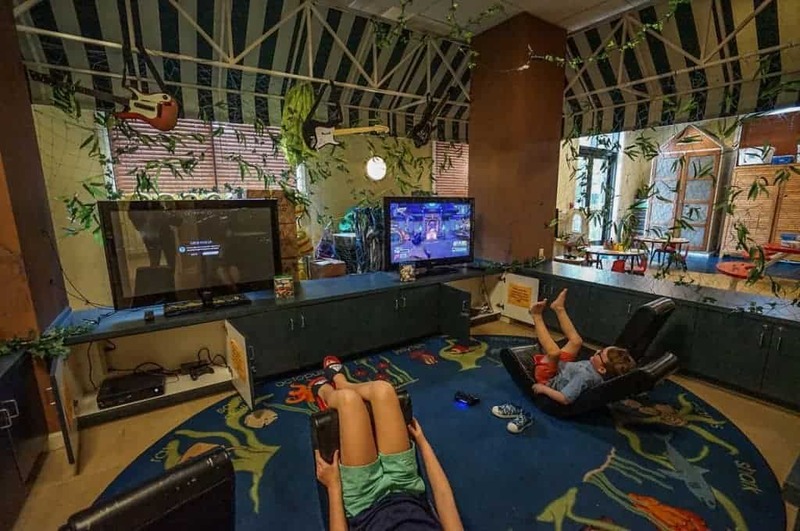 The kids’ club at the Omni in between a small arcade and an outside playground. The evening sessions are available on Friday and Saturday nights only. There are daytime sessions as well as several activities for families to do together throughout the day. A truly beautiful experience happened for our family during one of the many scheduled children’s activities throughout the day. A large family of siblings and cousins arrived for an egg race with my kids where children clamped fiercely on spoons holding eggs while racing to touch the trunk of a tree. Getting eggs and spoons from a Camp Omni counselor who organizes family activities throughout the day. My son was the youngest competing in the race, and I noticed that the oldest competitor, a young girl around 13, kept dropping her egg, forcing her to return to the starting point. It was only finally my son and she remaining. I realized she was throwing the race intentionally so that he, the youngest competitor, was not the last to finish. Her kindness really struck me, even leaving me a little teary while I was watching my son earnestly try and reach the tree, only to keep dropping his egg a few yards away. I thought I could praise her without tearing up a little, but I had no such luck. I’m a mom who wears her heart on her sleeve. We recognized Eric at the pool on our first day. We had taken two eco tours with him on prior trips to Orlando. He’s an Audubon naturalist and fisherman, and there is no nature question your kids can’t throw at him that he can’t answer. Eric can arrange fishing trips, alligator tours, kayaking, and more on this massive property. I mentioned my excitement to seeing to bald eagles from my balcony, and he informed me that bald eagles are most sighted in Alaska and Florida. Who knew? 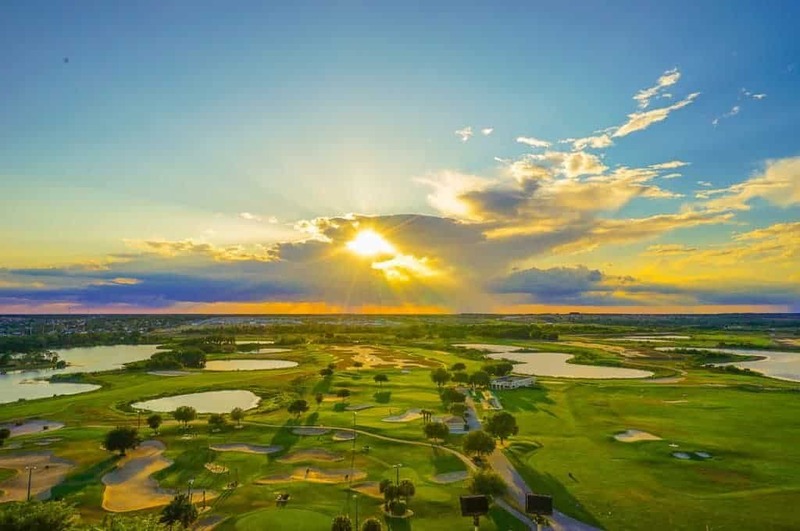 ChampionsGate offers two Greg Norman courses, a par-three course lit for nighttime play, and the world renowned David Ledbetter Academy. There’s a mini golf intensive to work on putting at the Ledbetter Academy at the Omni. 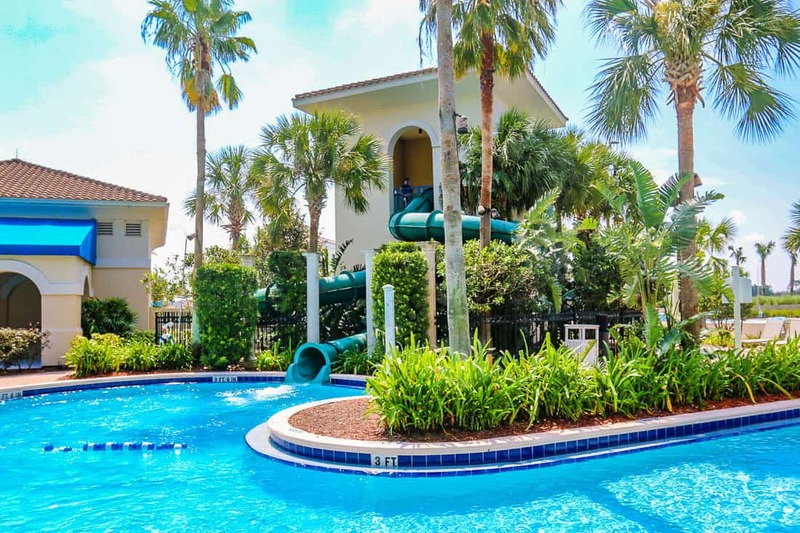 For the more casual golfer, a mini golf course is next to the pool area and works well as an activity to pull kids out of the pools and dry in the sun. 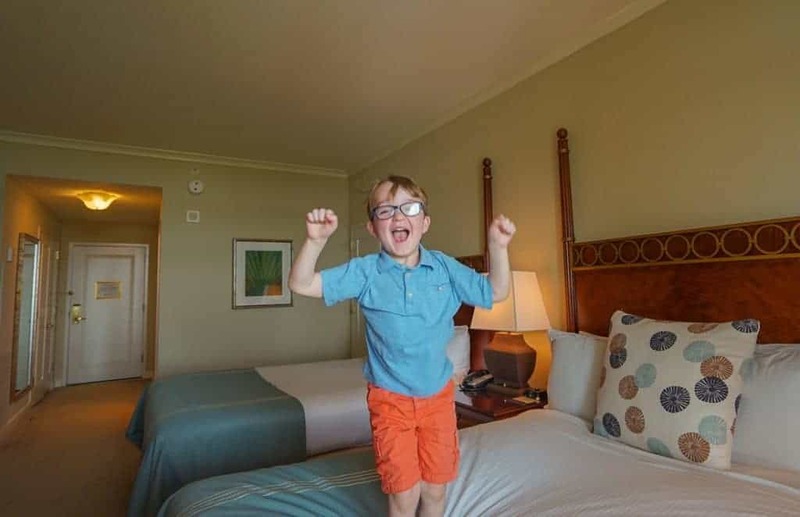 For those families traveling with only one or two days of parks on the vacation agenda, then the Omni would be a fantastic choice for a week’s stay. 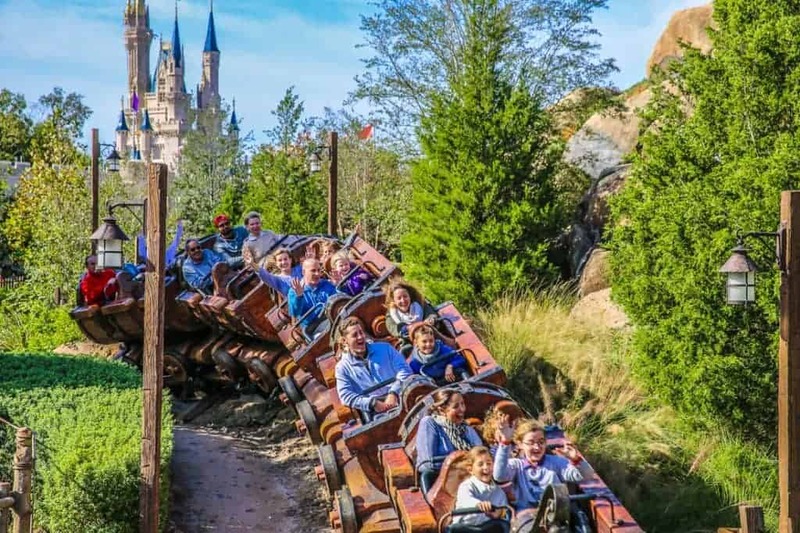 Or as we like to do, we like to start at a Disney resort for a few park days and retreat to an offsite full-service resort like the Omni to rest and recover and get on our return flight feeling like we actually had a vacation. The resort offers complimentary shuttles to Epcot and the Transportation and Ticket Center for Magic Kingdom. Departure times are 8 A.M., 9:45 A.M, and 11 A.M. Return shuttles are available at 1pm 3:45 P.M., 6:30 P.M., 8:30 P.M. These times could change, so please contact the concierge desk closer to your stay for the most current schedule. Taxis from the hotel will cost $50 to the parks, and Uber would be less, but pricing is based on demand. 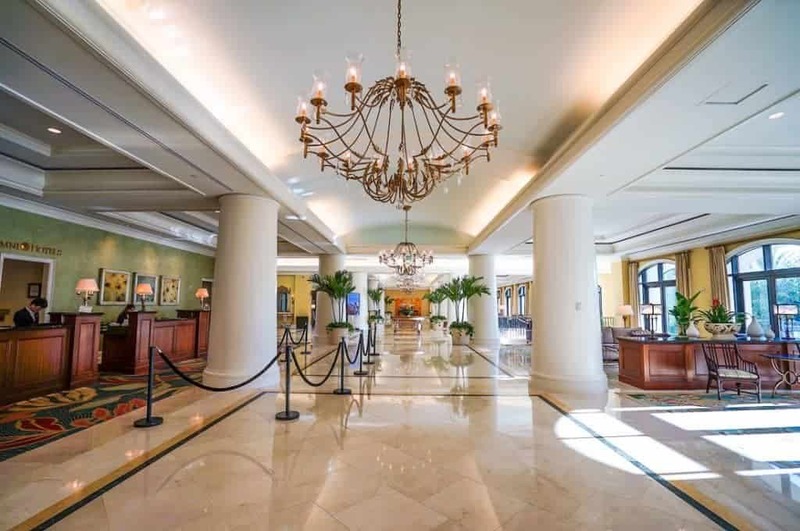 Although the price of park transportation sounds steep, the Omni will nearly always be available at a nightly rate at a fraction of Disney’s deluxe resorts, so the overall value for the resort is still great. 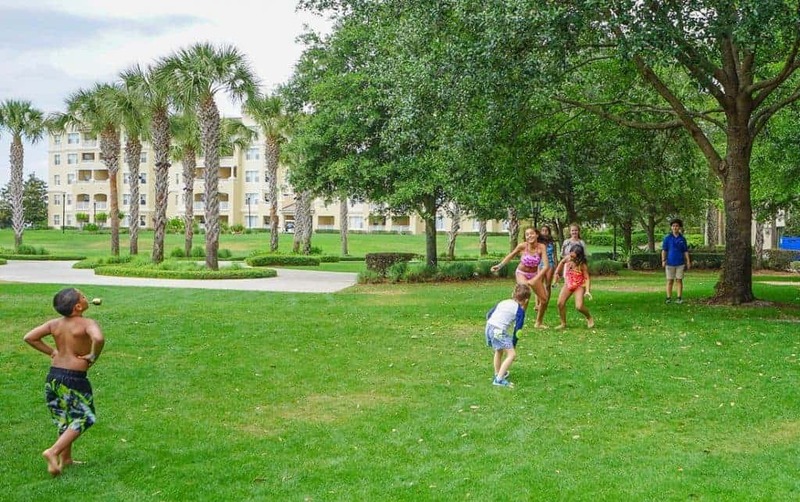 I adored the resort for how easy it was for me and my children to fill our days with fun. Anytime we needed to relax, we completed a few laps in the lazy river to reboot. We experienced the property on a Saturday and Sunday, and the pool was noticeably more mellow on Sunday. I would love to return midweek to have the pool complex almost to ourselves and to enjoy the new kid and wave pool expansion. After a sunset symphony from our balcony, we went down to use our s’mores kits at the nightly bonfire. 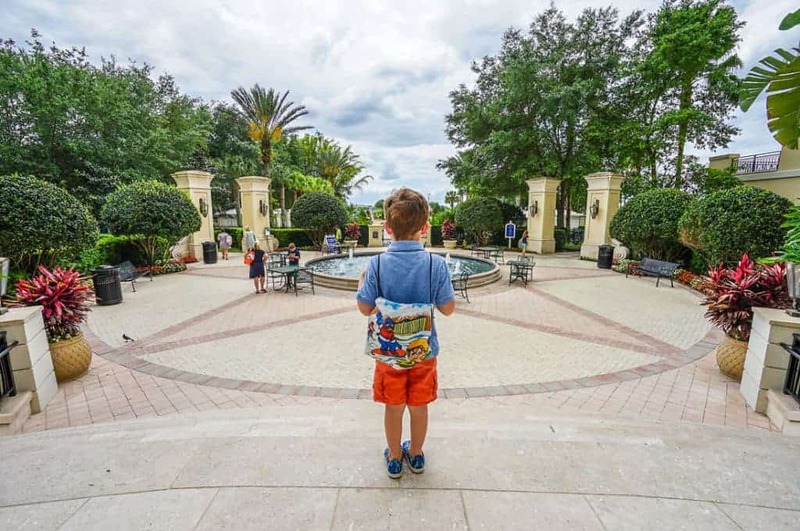 Although we were guests of the Omni Orlando Resort, these opinions are entirely my own. Check your travel dates for rates at the Omni.